Limitation is the mother of innovations and twitter hashtags is a wonderful example of it. 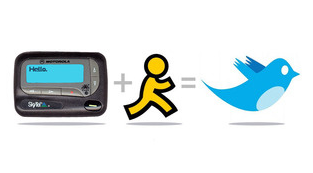 Twitter is one of the fastest growing website with more than 600 tweets per second. And it was becoming too difficult for the tweeple to keep track of the topics of interests with more and more tweeple following each other. And hence the #tag was born. Twitter provided no easy way to group tweets or add extra data so the Twitter community came up with their own way: hashtags. A hashtag is similar to other web tags- it helps add tweets to a category. A hash tag is simply a way for people to search for tweets that have a common topic. Hashtags have the # symbol before the keyword. For example # + Google = #Google is a hashtag. It’s not case sensitive so #google and #Google is one and the same thing. This snapshot from siesmic shows a tweet with #USB #futuregadgets and #gadgets . This signifies that the tweet emphasizes on usb, featuredgadgets and gadgets and has information about some usb gadget that has been featured on the article that can be found on that particular shortlink. The words that are preceded by # are treated special by Twitter. 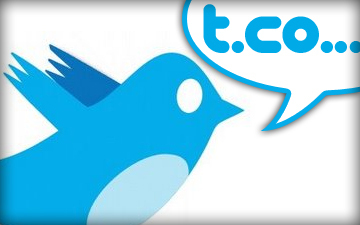 They become the keywords and kind of help the users track the tweets and trends in a better manner. #tag has more weight than a normal word without a # when searched for. Suppose we are searching for tweets related to newly launched Buzz by Google. 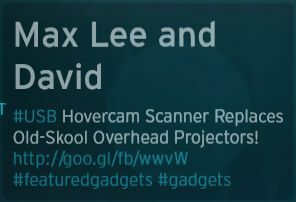 We just need to look for the #Buzz or #Google and this would list the tweets that contain any of these two #tags in them. Suppose we want to start our own trend then we need to just decide on a keyword. And before just going ahead with adding a # to it and start tweeting we just need to check whether the #tag already exists. If it doesn’t we can use it and then tweet and tell our friends about out #tag and start a trend of our own. The larger the number of tweets containing a particular #tag more popular it gets and hence has a higher trend. To check what are the trending topics [#tags] check out #hashtag. I … [hmmm I need to change the starting style most of my posts start with I]. This is for all twitter users who like to tweet all the cool stuff which is found on the internet. Now there are two ways to tweet the info you like. You use twitter on website. >So you copy text you want to tweet and paste into the twitter box. >Then you copy the url/link. >Goto any url shortening service website to get a shortened url and copy that. The second way is use some twitter client like tweetdeck that saves a step by shortening the url by itself. But still if u want to share a lot of good stuff then it becomes tiring. I always wanted to have an application that allowed to me to highlight the text to be tweeted and if that text contained a link then that link should be shortened and appended to the end of the tweet. I asked a few friends how to go about developing it on my own… As its a well proven fact that I am a lazy person so I waited for this kind of app to be developed and kept checking continously and today I have found one. 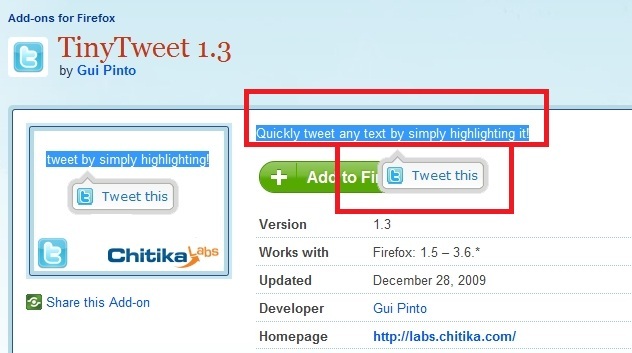 Simply highlight any text inside of any web page, and a “tweet this” button will appear. 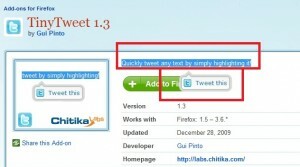 Click it, and an automatically generated bit.ly link is created, and the selected text is ready to be tweeted!